My sweet baby boy is no longer a baby at all. He turned three this past weekend. He’s technically a toddler and really is already turning into a little man. Celebrating his birthday is absolutely one of the most special occasions for our family, as we mark another year that he has filled our lives with joy. 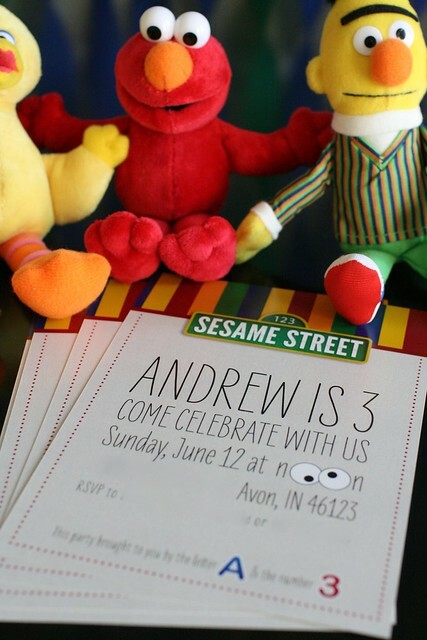 Now that he is at the age where he kinda sorta understands birthdays, I wanted to plan a party that he would really love and I didn’t need to look much further than a show we watch together and enjoy often, Sesame Street. 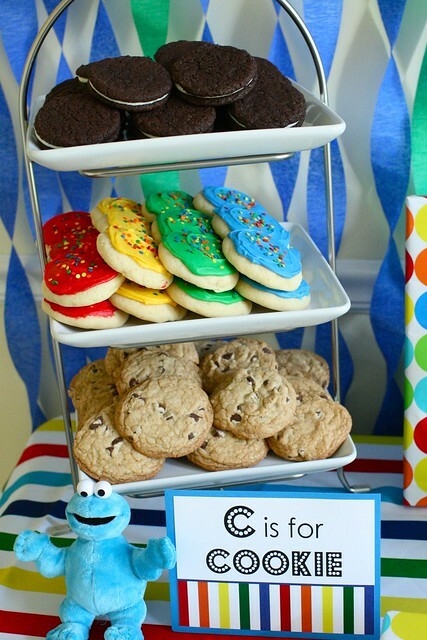 We love Sesame Street for its fun characters and inventive educational messages, so I thought it would be a great inspiration for a toddler birthday. I decorated in a bright color palette of red, yellow, green and blue with some orange thrown in, and tried to incorporate some of the characters from the Street into the decor as well as the games we played. Ben and I did most of the decorating for the party very late the night before the party while he was still sleeping, so when he woke up in the morning the house was mostly set up and ready to go. Watching the excitement on his face as he walked from room to room discovering all the party games and decor was the best part of the day for me. 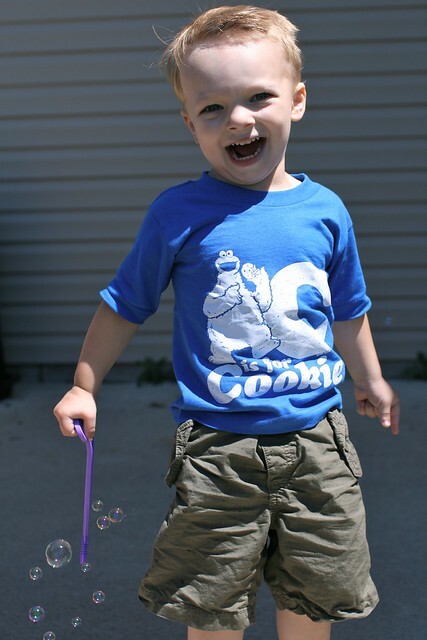 His smile just kept getting bigger and bigger – so adorable! 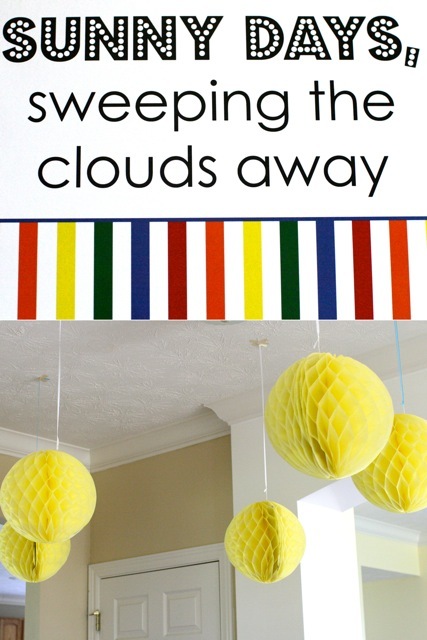 The front door was decorated with a “Sunny Days” sign, and there were numerous bright yellow tissue poms in the entryway to greet guests and recall the famous Sesame Street theme song. 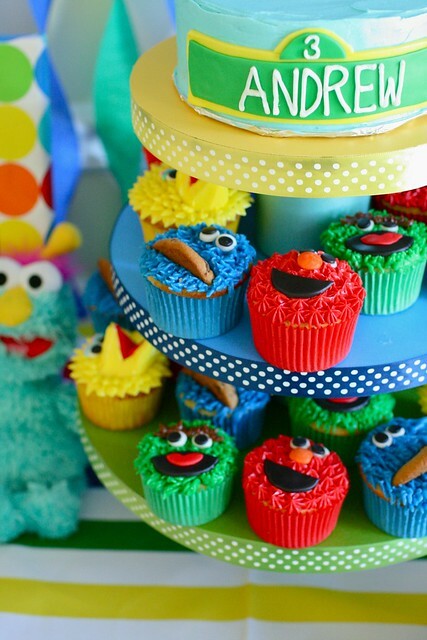 The centerpiece of the main food/dessert table was the DIY cupcake tower with Elmo, Big Bird, Cookie Monster and Oscar the Grouch cupcakes. 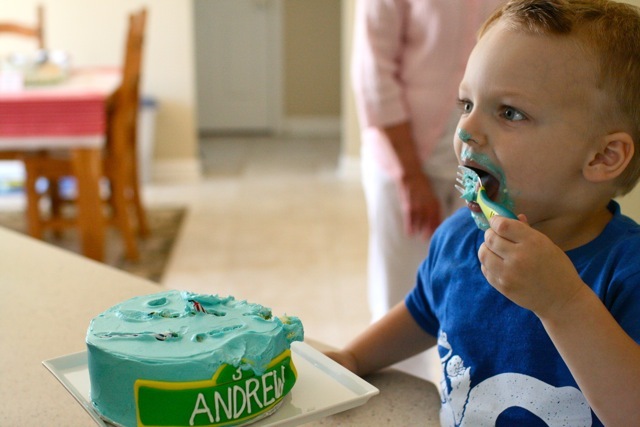 I also made a 6-inch smash cake for the top tier so Andrew could blow out his candles :) These cupcakes were so much fun to make and everyone loved them. (I’ll post a tutorial for decorating the cupcakes in the future.) The cake flavor was vanilla bean with vanilla buttercream frosting. 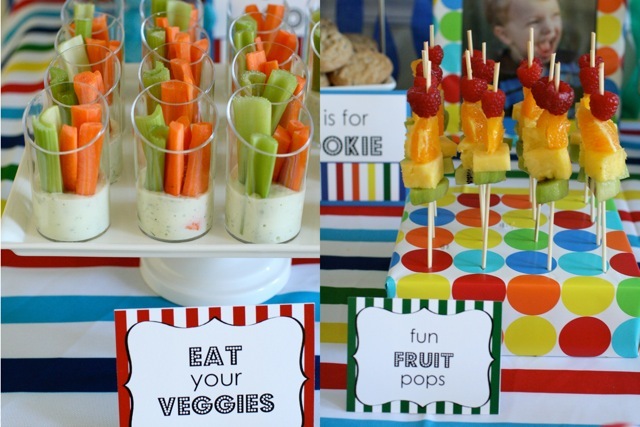 Since Sesame Street definitely makes a point to emphasize healthy eating, “Eat Your Veggies” cups and “Fun Fruit Pops” were a fun way to incorporate that concept while also providing some more nutritious fare. I was a bit worried about kids eating the fruit skewers so I made sure to cut off the pointy ends. 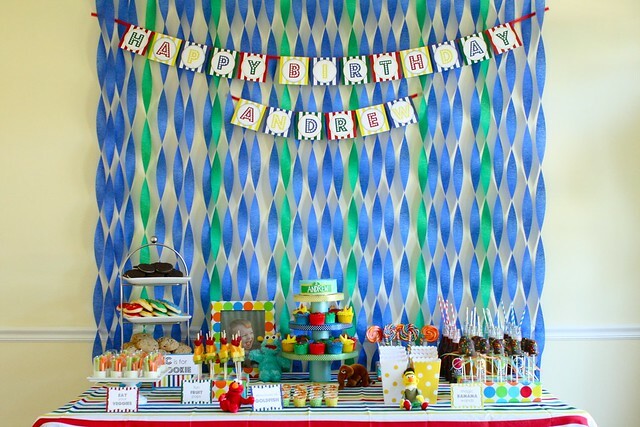 The kids loved them, and I think they were Andrew’s favorite food at the party. Any kid or parent who watches much Sesame Street these days knows the theme song to the Elmo’s World segment very well. 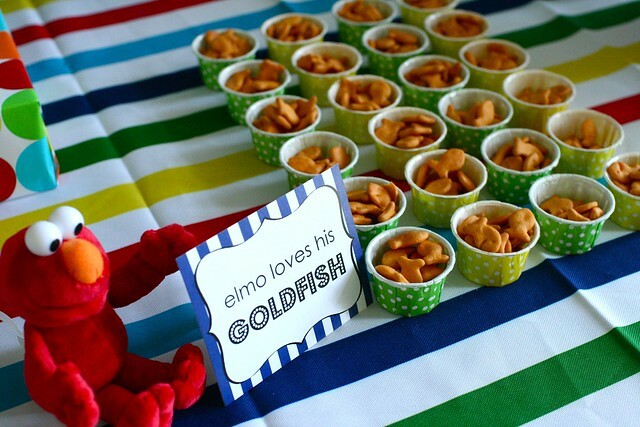 I made a play on that and Elmo’s pet goldfish by serving goldfish crackers in cute little party cups. 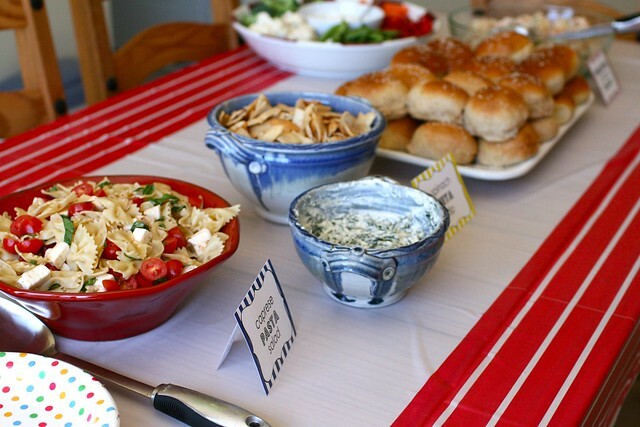 This ever-popular kiddo snack was a huge hit and kids kept grabbing a cup here and there throughout the party. 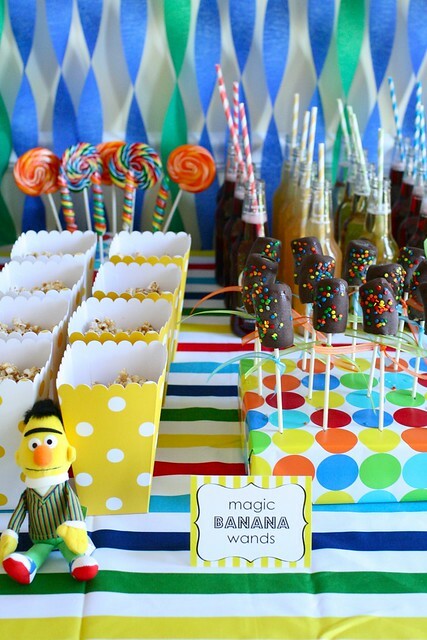 The other goodies on this table included “magic banana wands” (a nod to the Fairy School segment of Sesame Street), caramel corn, brightly colored lollipops and red, yellow, green and blue bottles of Izze with fun striped straws. 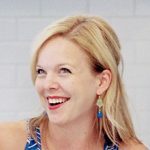 My best friend Amanda helped me brainstorm a lot of fun ideas for party games that the kids could play. She is brilliant, I tell you! Since the kids attending the party were mostly Andrew’s age or younger we kept the games very easy, simple and fun. 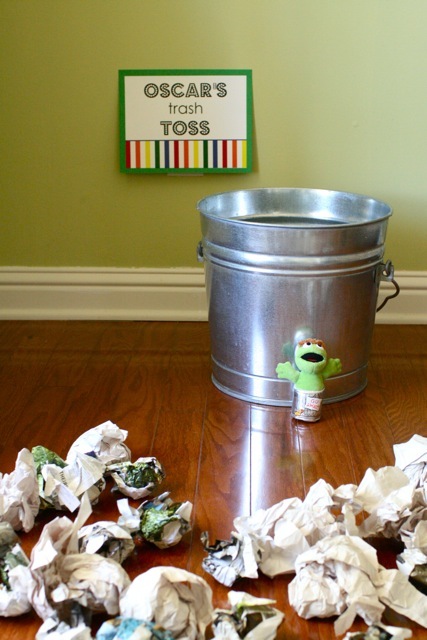 Oscar’s Trash Toss was incredibly easy to set up – just a metal trash can with crumpled up junk mail for kids to toss into the bucket. It was such fun to watch them play this game! 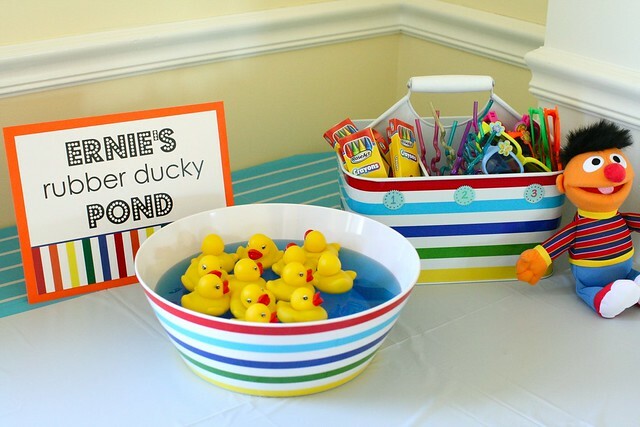 A bowl full of water and some little rubber ducks made up Ernie’s Rubber Ducky Pond. Each duck had a number labeled on its belly that corresponded to three different prizes. 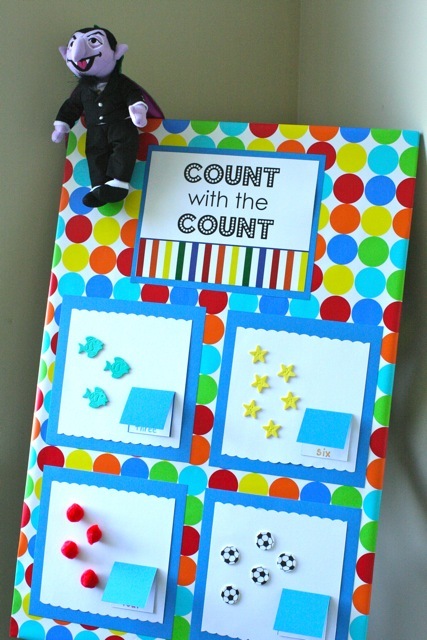 Kids could match up the number duck they chose and claim a prize. I remember playing a game similar to this at the school carnival when I was a kid and I loved it. 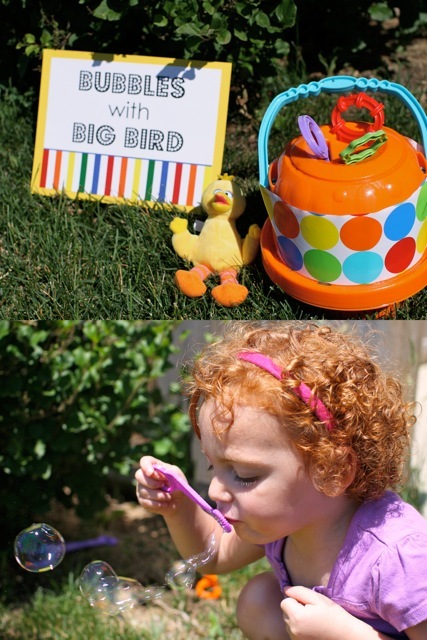 Bubbles with Big Bird was definitely the most popular game with the kids because it involved playing outside. This wasn’t really a game at all – just a couple bubble buckets and a bubble generator. As you can see, the birthday boy thoroughly enjoyed himself. We lucked out with really great weather on the day of the party – mid 70’s and sunny. Can’t beat that! He got so excited about blowing out his candles that he blew them out before we were even finished singing “Happy Birthday”! It was hilarious. 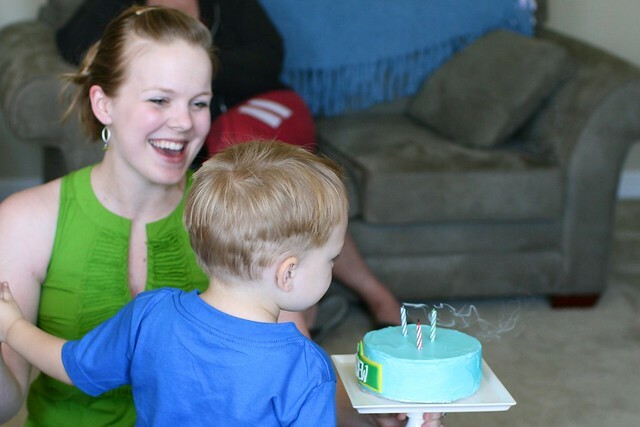 Watching him “eat” his smash cake was equally hilarious. He really didn’t eat much of it at all, mostly just smeared icing all over his face. Classic. 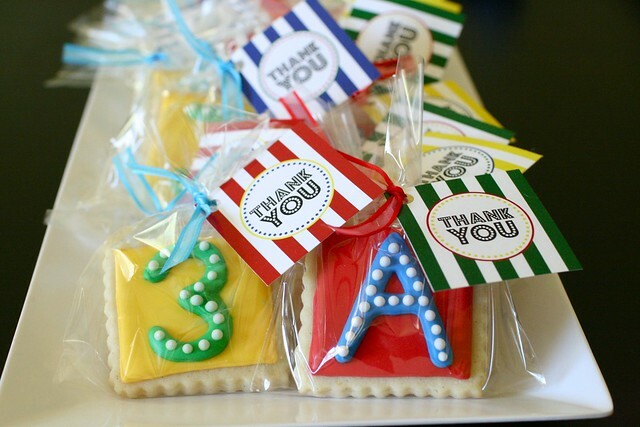 Of course I can’t resist any opportunity to decorate sugar cookies so I made some as party favors from our sponsors, the letter A and the number 3. His real cake time came after all the guests had left, and then he chose to enjoy an Oscar cupcake. Oh, how I love this boy!